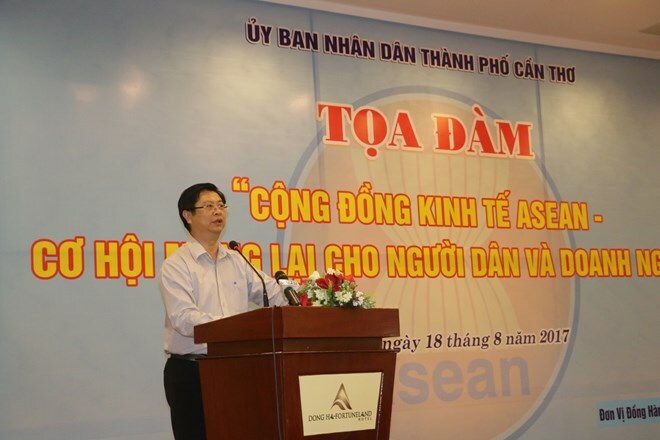 Can Tho (VNA) – The Mekong Delta city of Can Tho wants to capitalise on chances in economic activities with ASEAN, especially the ASEAN Economic Community (AEC), Vice Chairman of the municipal People’s Committee Truong Quang Hoai Nam has said. The opportunities created by the AEC, which came into being on December 31, 2015, for people and businesses were spotlighted at a seminar held by the Can Tho People’s Committee on August 18. Participants presented cooperation opportunities for Vietnamese firms in the AEC, the country’s commitments in the community, the country’s optimisation of origin principle to benefit from the AEC’s tax incentives, along with opportunities and challenges for the Mekong Delta since Vietnam became an AEC member. Nam said Vietnam joined ASEAN in 1995, and the bloc has since been a gateway for the country to intensively integrate into the world in terms of politics, economy, culture and society. A number of delegations from ASEAN countries have come to Can Tho to seek investment opportunities over the last couple of years, and the city also wants to learn about ways to cooperate with regional nations, he noted. Tran Huu Hiep, a member of the Steering Committee for the Southwestern Region, said when Vietnam is an AEC member, Can Tho and other Mekong Delta provinces will have numerous opportunities for development cooperation and investment attraction. However, there will also be challenges in goods production and sales, and competition in trade and services. To help people and businesses make use of chances during the AEC integration, Can Tho, as the centre of the Mekong Delta, need to take measures to develop skilled manpower, boost regional connectivity, fuel key industries and their support sectors, reform the business climate, and facilitate the operation of small- and medium-sized enterprises. It is also necessary to form value chains for the strong products of the city and issue strict regulations to manage the inflow of ASEAN labour into Vietnam and effectively govern free capital flows between Vietnam and ASEAN, Hiep added.